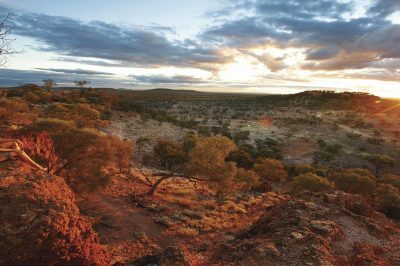 In the heart of opal country, you can do as much or as little as you want in Quilpie. Witness a spectacular sunset from Baldy Top Lookout. Baldy Top is a boulder formation, gradually shaped and carved by the weather since time began. The short climb will be rewarded with breathtaking views of the surrounding country. Marvel at the “Jewel of the Outback” the spectacular boulder opal displayed in all its fiery glory at St Finbarr’s Catholic Church. Explore the mini-museum at the airport commemorating Amy Johnson’s unexpected landing in 1930. Delight in the murals and sculptures located in the streets, or spend time visiting one of the regular exhibitions hosted throughout the year. The Quilpie & District Show, Rodeo and Gymkhana showcases the skills and determination of the men and women living and working in the region. Held in early September, it is an action-packed day not to be missed. If you want to frock up, the Quilpie Diggers Race Club host many events throughout the year, including the Quilpie Cup in early May and the Pride of the West Station Challenge in September. Typical for the Outback, December, January and February are the hottest months of the year. The weather starts to cool in March and remains clear and pleasant until October/November, when the mercury starts to rise again. Quilpie is very dry, with an average annual rainfall of 40 cm. Approximately half of the annual rainfall occurs, between November and March, however this rarely reaches more than 5 cm in any one month. Quilpie was declared a town with the arrival of the Western railway line in 1917. Quilpie was not the planned final destination of the line, the original destination was to be in Adavale. However, the line was redirected to the town now known as Quilpie. It was nearly two decades before the first passenger services commenced in 1935. By 1951, there were two services weekly between Charleville and Quilpie providing a vital link to the residents. Many older residents still recall catching “The Flying Flea”, claimed to be the fastest passenger train in Queensland at the time, to Charleville. In the heart of opal country, you can do as much or as little as you want in Quilpie. After spending time exploring this small town, you may decide it is actually the beginning of the line!